Discussion in 'The South' started by profro, Oct 6, 2005.
do a search nOOb! No, seriously, it was in one of the Dark mtn picture threads. I agree, that is one badass picture. Kinda like the one of Herndon on the rock at Sugar this year. It just looks fast. I guess I wasn't in the searching mood lastnight. Now, I wonder if she sells digital images or just prints?????? Matt?????? Since we're showing shots of profro........Dark Mtn. Yeah, I got that one too and I like it. But that other one has been my fav from this year. In that same series of pics there is one of Ryan Taylor and it looks bad a$$ too. That jumps was a crazy one. 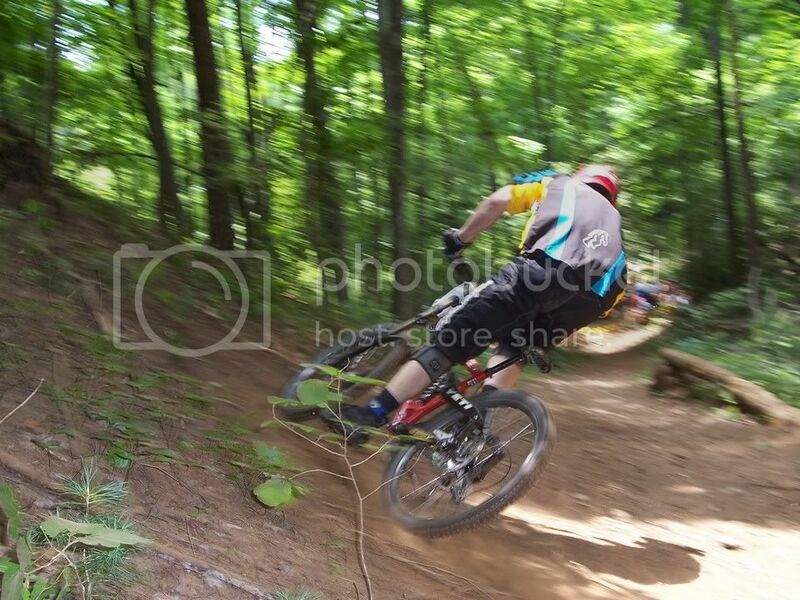 In the picture it looks like the bike is about to come out from underneath me. Yea who ever took the pics @ the A-frame did a good job. here is a couple of me . Yeah, I'm sure Sandra will hook you up. You can send her your info via the link below or her phone number is listed on the site as well. I'm on a high-speed computer right now & it rocks..Pics in a split second..
:10 each pic. at home on dialup.dam! sweet pics. ohh and kinda off topic where is dark mountain. i asked some people and they didnt even know what state it was in. i just was wondering so that i could attend that race next year. Wilkesboro, NC bro. you coming home any time soon? Also we're targeting the weekend before the National at Sugar. I'd reccomend 2 weeks before bro...give people time to collect a paycheck in between. I've seen events that are on back to back weeks lose attendance b/c of it. Good point, I hadn't thought of that...we were thinking that it might increase attendance if people came in early. We'll try to hit a different date once the National schedule comes out. Thanks! Two weeks before is the US Open. You might loose a few (including me), but you probably won't loose too much of your beginner, sport, or expert attendence. How about the weekend after? But waiting until the Snowshoe race series schedule is announced might be a better idea. well don't take my word for it. You may be getting it right, but I can't say definitively. I would email Sandy White and ask his opinion on hte date. He has been the NORBA official in NC for over a decade and could better advise you on how that would play out. Any date conflicting with the US Open is gonna be a negative. There were a bunch of locals up there this year, and I bet there will be even more next year. Matt, i would say the only event that could pull numbers the weekend before would be Sugar itself. Otherwise the travelling pros will stay away. Oh does anyone know who is running the Cane Creek series? so somebody explain to me why they think "traveling" pros show up to a NORBA a week early? Especially considering the way the schedule for next year will pllay out. I'm guessing International pros will have flights scheduled for a direct overseas to whatever World Cup lands on the weekend after the US Open. I would say having a race at Dark Mtn the week before will draw the same people it would on any other date because it had a great review from everyone who rode it last year. I thought about it more and people who would hit up Dark Mtn are NOT really the same as those who would hit a National anyway. Some things it might do would give local XC & DH people a tune up event on either weekend mentioned. We all know how it helps to have raced the weekend or 2 weeks before a big event to get your mind in it. I've already initiated contact with Racer's Edge & plan to speak with the folks at Snowshoe before scheduling if at all possible. Right now the main hold up is the National schedule so hopefully it will be posted soon. I know that Sandy needs to have the schedule for Cane Creek this month I believe? Well, it does depend on their schedule, but if you have a race the week before at the same resort, pros will show up if they can. which was won by Sam Hill and had a stacked class. Now do I think Sam Hill is going to show up at Dark Mountain and push up the hill with us.......................No. okay guys i appreciate it. bizutch i would say im comming in about two to three weeks. my crew and tp crew have a pisgah camping trip planned in two to three weeks. so you guys are more than welcome to attend and take part in the biking and dont forget the fun. okay guys i appreciate it i guess ill see you at sugar, dark mountain, and maybee the open (hopefully sooner). okay guys im out supper time. actually, from what that guy Craig Woodhead said, the Aussies are used to pushing up at most all their events...."Sam Hill wins Dark Mtn on prototype Iron Horse "6"...industry stunned.